Frankly, I’m tired of everyone picking on the white iPhone 3G. When it was announced, the wow-it’s-girly comments began almost immediately. Who could imagine buying such a wimpy, weanie, feminine piece of gadgetry? Anyone who opted for the white 16 GB iPhone was immediately branded a girly man (unless you’re a girl – then, for some reason, it’s okay). I say, enough. It’s time for the critics to realize that white is a great modern tradition among Apple products. Are the same folks who laugh at the white iPhone willing to laugh at the white iMac or iBook G4? How about the “new” discounted MacBook? What about the prevous iPod models? I’ll agree: Apple is moving to black and metal. Even the new iPod Classics come in metal or black, and the once-white MacBooks and iMacs are moving to the iPhone-like fit and finish. Over the last few years, Apple has moved from white to aluminum. So maybe that’s why the original iPhone, with it’s metal enclosure, was my favorite. It was the device that kicked off Apple’s new design sensability. Seeing the rest of the product line, maybe the black iPhone makes the most sense now that we can’t have a metal one anymore. But telling me the white iPhone is some how the namby-pamby choice among the 16 GB versions is to ignore almost seven years of iPod, iMac, iBook, and even MacBook history. Apple picked white because of its clean, no-frills look and snow-white aesthetic. Just because Apple doesn’t do white anymore doesn’t mean its the lesser choice. We tucked white iPods in our pockets for years, and we lived right through it. I still carry my 30 GB iPod video around and no one picks on me. Truth be told, no one picks on me about my white iPhone, either. Maybe they’re too amazed by my phonesaber or the cowbell I can tap with my finger. Just be thankful we have a choice this time around. The Newton came in one color: green. Sure, there was rugged camo green and see-through transluscent green, but green was it. Now we have choices, and I’ve made mine. 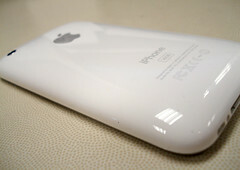 I’m so proud of my white iPhone 3G that I bought a white Countour case for it while I was at the Chicago Apple store. It’s missing the shiny Apple logo on the back, but it’s gleaming white, and I love it. Now my main Apple devices – my iBook G4, iMac G4, and iPod – all match perfectly. I wish the iPhone still came in aluminum, I really do, but since it doesn’t the pearly-white phone will still fit comfortably in my pocket, thankyouverymuch. All you white iPhone haters can purchase your black model and join the sheep that are too nervous to grip a beautiful piece of gadgetry in public. Maybe you’re prejudiced against the purest of the color schemes. That’s fine. We won’t agree. But can we at least agree that, no matter what color people opt for, the white iPhone 3G isn’t such a bad choice after all? Posted by davelawrence8 at 5:00 am on November 3rd, 2008. 8 comments... » Categories: ipod/iphone. Tags: apple, feminine, girly, ibook, imac, iphone 3g, ipod, white iphone, wimpy. Subscribe via RSS. So you went to an Apple store, made your purchase, sold your soul to some wireless carrier, and now you have tons of free apps downloaded and your voicemail is all set up. You’re an iPhone 3G owner. What makes you so special? It might be that you don’t have an Apple Newton MessagePad to play around with. It’s cheaper. The Newton MessagePad 1×0 series may cost you $15-30, while the 2×00 series might cost you $100-200. But that’s it. Except for wireless cards and the extra stylus, there’s no “plan” or “rate” to buy in to. You pay for it once. That’s it. The batteries last longer. Way longer. Like, weeks longer. I’ve noticed that my 3G iPhone can last up to two days with light usage, but in the end I still have to plug it in. My Newton 110? I’ve lasted a month on the same Sanyo Eneloop batteries. No color and no wifi help, of course, but the point still stands. You can fax. Faxing may be on its way out, or at least moving to the electronic world, but the MessagePad’s ability to fax – with the special modem – can be an advantage if (Steve forbid) wifi or cell towers ever went down. It could happen, and faxing lets you use the tried-and-true phone lines to do your communicating. Someone may release a faxing iPhone app, but in the meantime, your MessagePad has the market covered. No in-store activation required. No lines, either, and if you use eBay, it’s not as scarce as you think. It’s more rugged. Drop your iPhone and step on it. Now drop your MessagePad and step on it. Which would survive the fall and subsequent stomping? Place your bets. Newtons qualify as “underground.” Retro. Rare. Counter-culture. Whatever you want to call it, the Newton fills the “not-everyone-has-one-so-mine-is-cool” gap the iPhone 3G left behind. Before, the iPhone 1.0 was the rare species, eliciting looks and whispers when someone whipped one out. Now, Apple is selling tons of them. Which means, like the iPod, the “coolness” factor dips a bit. Not so with your MessagePad. You could probably count on one hand the number of people who own one in your 50-mile radius. Kids these days love their retro and throwback technology – what serves that purpose better than a Newton? It still has fun games on it. Every cell phone in the world has Tetris and chess and tic-tac-toe. So does your Newton. If your gaming style is “simple” over “Crash Bandicoot Racing,” keep your Newton around. Many games can be had for free. You already have a system that works. Why switch now? If your MessagePad fits your GTD needs already, switching to the iPhone involves setting up a whole new system. I, for one, am still trying to decide on what flavor of to-do app I want to use on my 3G. Save yourself the hassle. No AT&T involved. This goes along with point one, but really – any situation where you can avoid giant nation-wide media and communication carriers is a chance to show your shutzpah. Those of us who settled on buying an iPhone are still grappling with the catatonic depression that goes along with signing up with AT&T. And the fact that we had to wait in long lines to do so only strengthens the insult. Do your own thing. Hold your Newton tight. Your Newton is a “project” device. This is what originally drew me to the MessagePad. Setting up wifi and Bluetooth, sending and receiving e-mails, playing around with third-party apps and games, even syncing with OS X – the Newton gives you weekend projects that satisfy your inner DIY’er. The iPhone? Too easy. Unless you’re an app developer or a jailbreaker – in which case, Mr. Jobs would like to have a word with you – the iPhone is a device of convenience and comfort. You don’t even need Apple’s permission to make applications for the Newton. All you need is knowledge of NewtonScript, an inner drive, and a mild case of masochism. Don’t get me wrong: I’m loving my iPhone. Just the camera and the GPS are worth the madness that I lived through that Friday in July. Anything I haven’t thought of? Have a different point of view? Let me know in the comments. Posted by davelawrence8 at 5:30 am on September 22nd, 2008. 16 comments... » Categories: DIY, ipod/iphone, newton, newton history. Tags: apple, apple store, apps, at&t, bluetooth, games, GTD, iphone, iphone 3g, jailbreak, messagepad, newton, rechargable, steve jobs, wifi. Subscribe via RSS. The idea for cut and paste on the Newton is simple: scribble a word, press the stylus on the word until the highlight marker appears, highlight the word, and then either (a) double tap and drag or (b) just grab the word and drag it to the side of the screen (above – but there’s a great video demo over at Mental Hygiene). Your “clipped” word will appear on the side of the screen, slightly smaller and truncated. When you want to paste, simply grab the word with the stylus and drag it where you want it. It’s not true “cut and paste” because the word doesn’t disappear, but the effect is similar. …which is the last clipping that you touched with your stylus. Some applications have “cut” and “copy” and “paste” menu options, for the benefit of people with keyboards — if you choose “cut,” a clipping is automatically created on the side of the screen and becomes primary. 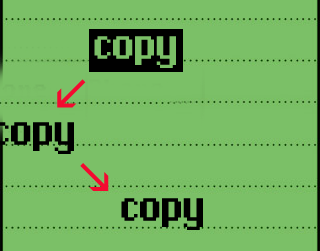 If you choose “paste”, the primary clipping is unhooked and pasted in. But with screen real estate at a premium on the iPhone, a mini-word on the side might be too large still. How do you “grab” a word? Or highlight it? Can you have multiple items in your clipboard? 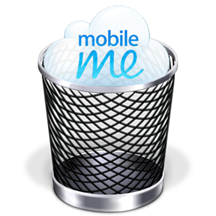 Can we trust a cloud-based method, after MobileMe’s ups and downs? Will it be a third-party solution, despite Apple shutting down the OpenClip project? Is there a smarter way? The technical side of cut and paste is far beyond my grasp. Besides, others have handled the explanation of how it was done far better than I could. But we can learn from the past. Just like the Newton and its standards (highlight, pull and drag, double-tapping for the keyboard, etc. ), the iPhone has standard ways of doing things. Perhaps all that’s needed is a new standard, such as a hold-and-click, or like the keyboard buttons that MagicPad showed us. But with evidence that copy and paste is on Apple’s to-do list, we’re left to wait it out. Any ideas on how the iPhone should do copy and paste? Posted by davelawrence8 at 5:18 am on September 8th, 2008. No comments... » Categories: ipod/iphone, newton, newton history. Tags: 2.0, apple, copy, copy and paste, cut and paste, highlight, iphone, iphone 3g, ipod, let's rock, magicpad, messagepad, newton, openclip, paste, standard. Subscribe via RSS. 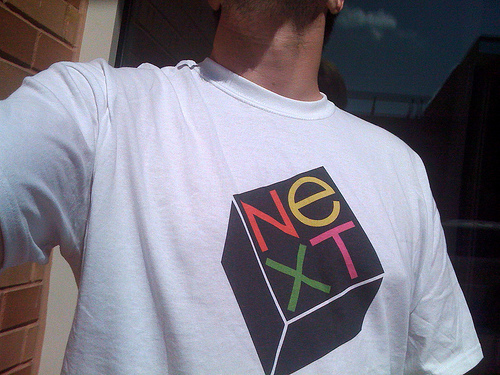 It seems like forever ago now, but all the fun we had on iPhone 3G launch day comes back to me when I watch that video. The “don’t-you-feel-bad” guys are T-Mobile reps, who had the bad luck of being stationed next to an Apple store at the Briarwood Mall. They had one customer the whole time I was there. T-Mobile shoppers were either too intimidated or too horrified at the gross consumerism to step foot at their home base. Good times. Relive the madness of that weird day in July, a whole month ago, when I reported from the front lines. Posted by davelawrence8 at 7:35 am on August 12th, 2008. No comments... » Categories: 3Glaunch. Tags: ann arbor, apple store, briarwood, cell, iphone 3g, launch, phone, t-mobile. Subscribe via RSS. 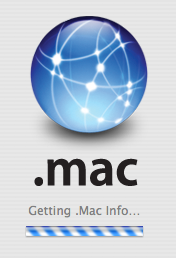 The above shot was taken on Sunday’s Macsurfer homepage. Just look at those headlines. If that isn’t a PR nightmare for Apple, I don’t know what is. 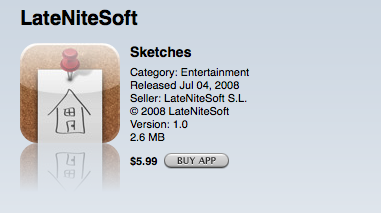 This after they did such a super job before the iPhone 3G was announced. Fortune talked about the perils of “event marketing” – how, yeah, a big huge event like this is fun and draws attention, it’s catastrophic when something breaks down. As it did on Friday. Apple is an expert at drawing press attention. That only makes the scrutiny laser beam that much hotter. Despite everything that happened, it could’ve been worse. But I’m starting to wonder how. Just from personal experience, this week has been a bummer with my Apple gear. First, I updated my Airport Express base station’s firmware. Afterward, the thing crashed, and now I can’t use my external USB hard drive. At least this is just the 60 day trial. 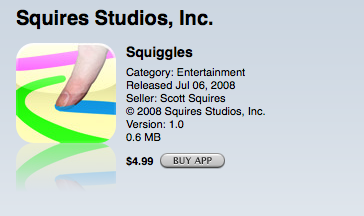 If I were paying for this, I would not be a happy Apple customer. And that’s just it. 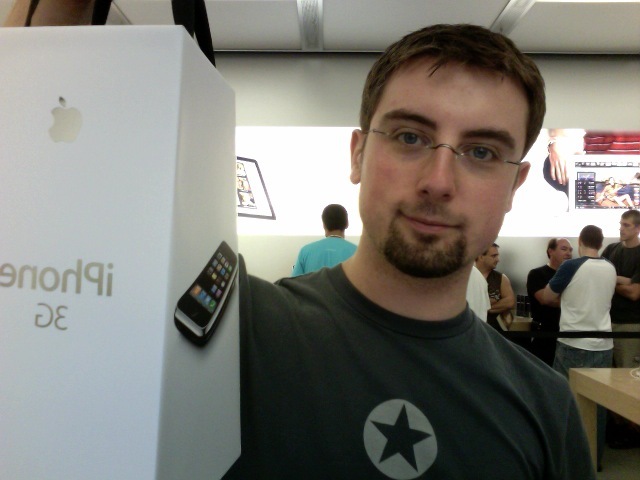 Even amidst Friday’s hellbroth during the iPhone 3G launch, I still played the dedicated Apple soldier. Most of the folks in line with me understood, too, that these things happen, and we were still a part of Something Special. But when the nuts of bolts of Apple’s operation start to come undone, that’s when you get people angry. People will stand in line for hours for the iPhone, no matter what activation issues are taking place, with a gritted smile on their face. That smile soon disappears, however, when basic things like Airport and “Exchange for the rest of us” (more like, “for the most patient of us”) start breaking down. Apple has got a mess on its hands, it seems, and I wouldn’t want to be their PR department for the next week or so. The least they should do is offer some sort of apology, admit their mistakes, and fix their damn software. Those are the basics. Do that, and we might forget our USB drive crashing through Airport Disk Utility. Might. Posted by davelawrence8 at 1:04 pm on July 14th, 2008. No comments... » Categories: apple, macs, OS X, software. Tags: airport, apple, at&t, base station, iphone 3g, mobilme, OS X, sync, tiger. Subscribe via RSS. I couldn’t help but scour the iPhone’s new App Store for applications that mimicked what the Newton MessagePad offered at its height. Here’s what I came up with so far. 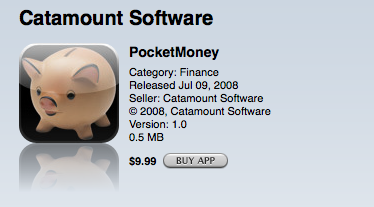 Good ol’ PocketMoney. This is a Newton classic, and they even brag about it on the description page. 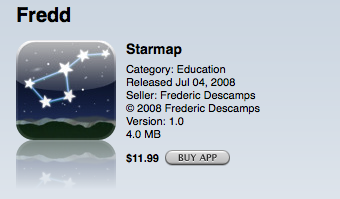 The Newton version is still available, and the new one will set you back $10. I was actually going to review the old school PocketMoney. Instead, it may call for a comparison. Starmap here is a take on the Newton’s StarChart: basically a star-finder and map that helps you look for planets and such when you’re in your backyard with a telescope. Darned handy if you are an astronomy fan. Squiggles is pure fun. You can take iPhone photos and doodle all over them in different colors. Your finger becomes the brush. I picked this one because it’s the first one I saw that, in whatever way, translates the MessagePad’s handwriting recognition into a creative app. Sketches looks like it has the most potential to be Newton-ish. Basically you draw notes, diagrams, or whatever with your finger, and save the file for later. Notepad, anyone? Have you tried out any of these, or another iPhone app that copies the Newton’s capabilities? Let me know in the comments. I’m going to try some of these myself, and offer a review later. Posted by davelawrence8 at 6:42 am on July 14th, 2008. 5 comments... » Categories: ipod/iphone, newton. Tags: app store, handwriting recognition, hwr, iphone 3g, itunes, messagepad, newton, rosetta. Subscribe via RSS. That’s probably the best news I’ve received all day: my iPhone is synced and ready to go. At 10 p.m., I finally got up the nerve to plug the sucker in and give it a whirl. And everything went great. MobileMe is offering a free 60 day trial for us suckers, so I thought, why not? 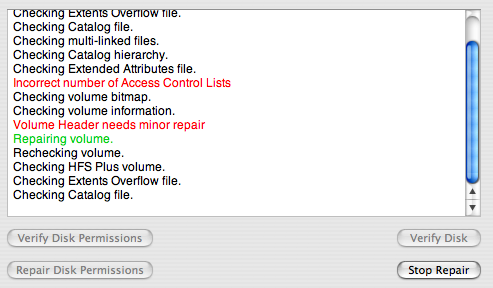 My System Prefs are still showing .Mac syncing, however, and I imagine it’s because I’m still a OS X 10.4 user. MobileMe is giving me error messages, so I’m not going to get my hopes up. But a free trial is a free trial. What’s the harm. Mr. and Mrs. America, and all the ships at see, I hope you’re having the same luck I’m having right now – which is good luck. Now I’ve got all weekend to play with the beast. Posted by davelawrence8 at 9:04 pm on July 11th, 2008. No comments... » Categories: 3Glaunch, ipod/iphone. Tags: apple, at&t, iphone 3g, itunes, mac, mobileme, newton, outage, sync. Subscribe via RSS. Ann Arbor Apple Store, 12:30, SUCCESS! At 12:25 this afternoon, I successfully purchased a white, 16 GB iPhone 3G from the Ann Arbor Apple store at the Briarwood Mall. “AT&T has been fun to deal with today,” he said with a sly smile. While I’m disappointed I can’t hop on the phone and start playing around, it’s almost better this way. At home, I can take my time and really absorb the thing. Looking outside the store, the line is still incredibly long – and growing. Before, the line didn’t extend far beyond where I stood. But now the whole mall is full of people in line. It’s madness. Workers on their lunch break, hoping to whip into the store and make their purchase, may lose their job if they’re not careful. The Apple rep outside the store gave me a “no comment” when I asked how supplies were holding up. My own specialist told me they had just a few of the white models left, so perhaps I lucked out. Whatever. After looking at their store model, I’m sure I made the right choice. So now it’s past my lunch time, and after all the coffee and water I’ve had there are important matters to deal with. Then I hit the road back home, get everything set up, and life begins again. But this whole thing has been incredible. The people in line were amazing company, the Apple staff were courteous and helpful (if vague with their information), and the in-store setup couldn’t have been easier. Over and out, for good, from Briarwood Mall in Ann Arbor. Posted by davelawrence8 at 11:32 am on July 11th, 2008. No comments... » Categories: 3Glaunch. Tags: ann arbor, apple store, briarwood mall, iphone 3g, line. Subscribe via RSS.